Cheating's bad, right? Except when it's not. Take, for example, chocolate croissants. I'm quite certain that the real deal involves more butter than I care to know about and several hours of rolling and folding and fridging and fiddling, and to be honest, I can't be bothered. I'd rather a) go to France and buy a fresh real one, or b) use puff pastry and cheat. It's true, I enjoy making good food - that's part of the reason you're all here ... but I also enjoy my time spent living, and I know my limitations. (Which are, in no specific order: housework, pastry, primary-school-aged craft, and seeing my true reflection in mirrors). This is not to say that I will NEVER make pastry, but I'm disinclined to - barring extraordinary circumstances. Zombie apocalypse? Damn right, I'll make pastry. Until then, I'm going to cheat - and I recommend you do, too. I'm pretty sure any gluten-tolerant mum on earth would appreciate some chocolate croissants and tea or coffee delivered to her in a cozy, sun-drenched bed on Mother's Day (next Sunday), on a tray with flowers and/or artworks and/or vouchers for massages of the aromatherapeutic sort. I know this would make me very happy - and in fact, if you're in Santa Fe and want to drop by with a present or some croissants for me, I'd be very happy about it. I'm in town till Sunday for a science writing workshop that ends on Saturday, leaving me thus far grossly underwhelmed about Mother's Day on my own. I'm thinking we should all postpone it by a week. Would that be ok with you? Anyway, this isn't about me. This is about you, and whatever mum-like figure is part of your life and about some chocolate croissants so deceptively simply delicious you might never want/need to go to France again. France, 2011. And please ignore what I just said about not going. Go. I'm not sure how much you'll hear from me this week, since I'll be workshopping with other scientific and journalistic types, but I wanted to share this recipe with you before Mother's Day - and remind you of the last cheat's bakery goodie I gave you, as well, just in case you prefer your breakfast open-faced. 1. Defrost the puff pastry according to package directions - this may be overnight in the fridge. 2. When the pastry is softened and you're ready to go, preheat the oven and a baking tray to 200C/180C-fan forced (350F). 3. 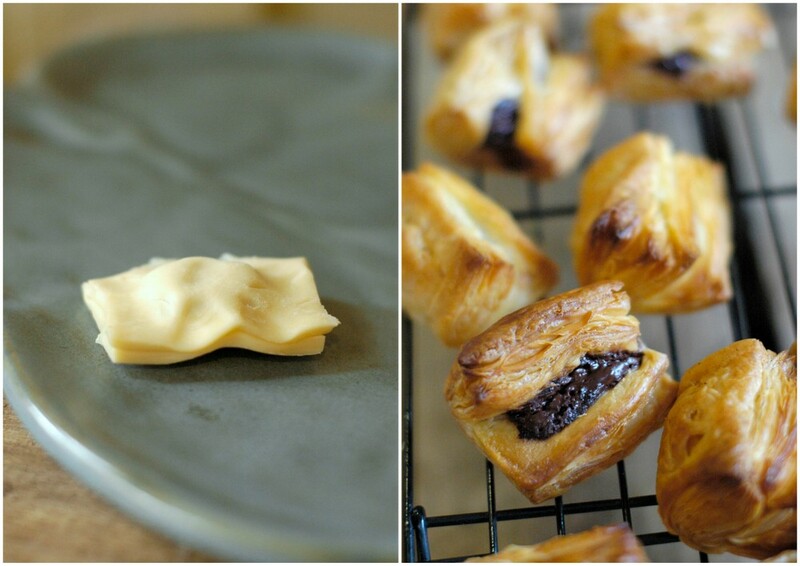 Cut the pastry into small foldable rectangles - the size and number is really up to you. I tend to make rectangles of about 2x3" or 2x4" - but really all you need is a rectangle you can fold over a piece of chocolate. 4. Fold the pastry rectangle over a piece of chocolate - I tend to use one square per pastry, but obviously use more if you're cutting the pastry larger or just want more chocolate. Press the edges together. Poke the centre so the chocolate doesn't explode - or don't. It doesn't really matter because exploded chocolate croissants taste just as good and look even more exciting (see above, because I didn't - uh - poke my pastries). 5. 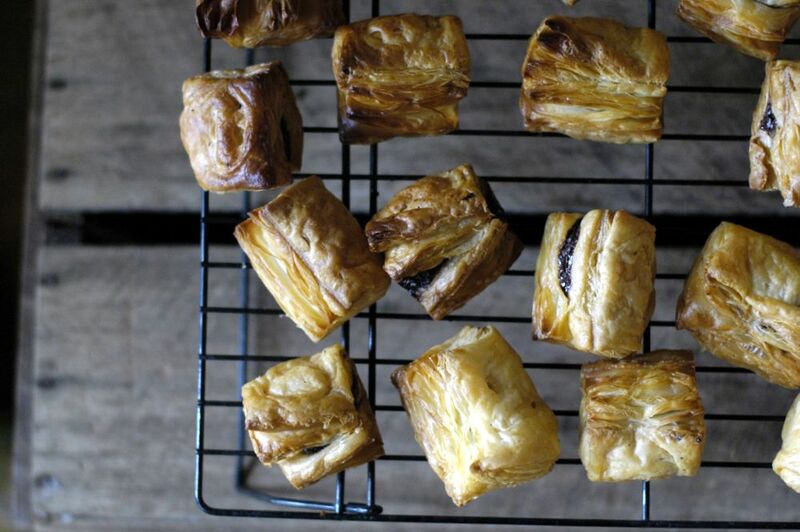 Place the croissants on the heated baking tray - using parchment or baking paper so they don't stick. Bake for 15-20 minutes (if they're small, like those in the picture), removing them from the oven when they're puffed and golden. Cool for at least 10 minutes, or you'll get a mouthful of molten chocolate, which kinda hurts. Not cheap, because we're going for QUALITY here. 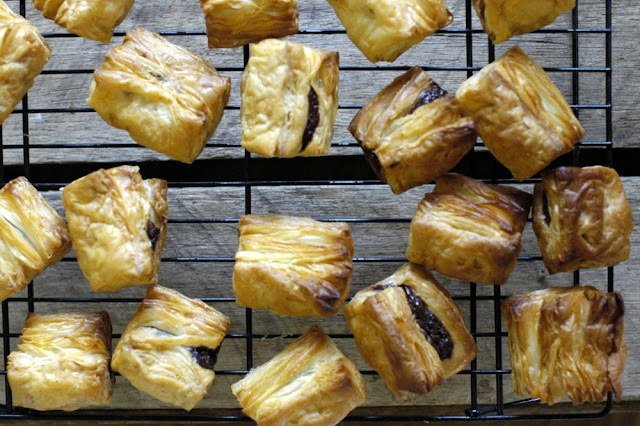 You will taste the goodness of the pastry, and the goodness of the chocolate because there are only two ingredients and you eat them practically naked (the ingredients, not you, unless you want to). I used 1 large Careme puff pastry sheet ($11) and most of a 100g block of Green and Black's 70% dark chocolate ($3) and made ~16 or so little pastries. I have no idea what happened to the rest of the chocolate. @Loretta E. Yes - time better spent *eating* the pastry!